More vulnerable than the burlesque actress donning nothing more than blue body paint, Lifeball organizer, Gery Keszler, made an on stage confession at this past Saturday night’s Lifeball that struck a chord still resonating days after the event. Amidst the glitz and glam, golden clogs and leather flogs, Gery Keszler stood tall in front of an audience of thousands and announced that for over 20 years, he’s been living HIV positive. Tears streamed down his face as he shared his story of traveling to Australia as a young man and returning to Vienna with an illness so unknown in Austria that at first his physicians had no idea what was wrong with him. And now, two decades later, even in the midst of one of the city’s most celebrated annual events, his greatest desire is to see a world in which no Lifeballs are needed to raise money and awareness for HIV and AIDs because both have been eradicated. And yet, throughout the years, despite medical advancements, Gery Keszler has witnessed the death of many friends along the way who haven’t been so lucky. And eventually, this leads to the question any of us would have – why them and why not me? On stage between the carriages drawn by the Lipizzaner horses and fashion designed by Jean Paul Gaultier, death appeared spewing off quotes about life and death. For Viennese, death has always gone hand-in-hand with life and there is hardly a Viennese song or theater piece where death doesn’t make a sudden cameo appearance. And as always, death seems to be a rather witty, jolly fellow who is a bit disheartened that no one seems to like him. And yet, even in Vienna, or perhaps especially in a city like Vienna, where life and death, tomorrow and yesterday always seems to co-exist in a kind of tug-a-war until the city manages to shed off its old conservative ways like flakes of old skin giving way to the new underneath, the stigma of HIV and AIDs continues. And not just in Vienna. When it comes to HIV and AIDs it’s like the whole world has become a group of Long Island gossiping grandmothers, raising their hands to their mouths as their voices lower to a barely audible whisper that so-and-so has AIDs. As if speaking the words aloud will summon the AIDs and HIV gremlins and incite them to spread ill will to all within hearing distance. It is as if we as a society have drafted an unspoken but agreed upon hierarchy of illnesses from honorable to dishonorable and HIV and AIDs has been placed at the bottom of the disease totem pole next to leprosy and syphilis. 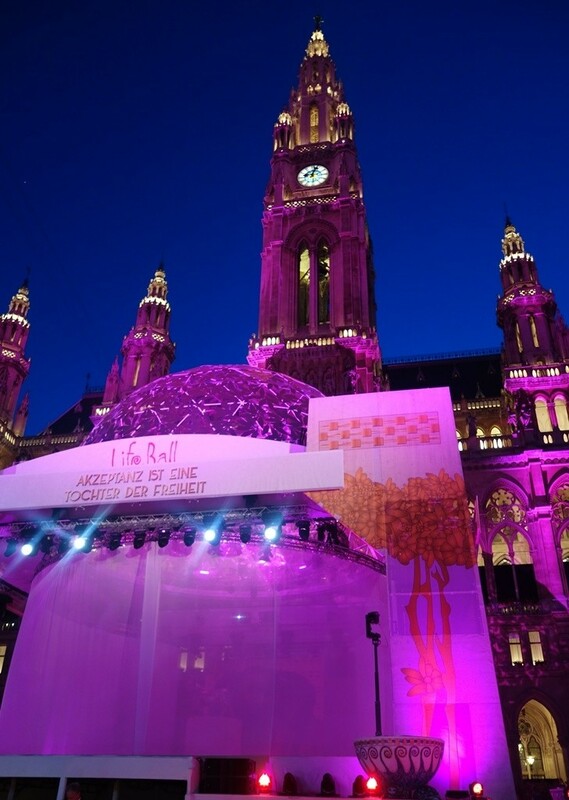 Thank you, Gery Keszler for a wonderful Lifeball and a memorable evening. Hopefully, future generations challenged with a disease, any disease, will never have to waste precious time and energy combating social stigmas attached to them so severe that causes those afflicted to be damned to decades of silence about their personal battle and suffering.